The VMI Mixer Feeder system cuts its way through cold rubber slabs up to 1200 mm width. The robust design of the IF 329 Mixer Feeder system makes it suitable for extensive rubber hardness range. This cutter is also capable to accurately cut soft or natural rubber, making it a reliable machine for your rubber production process. 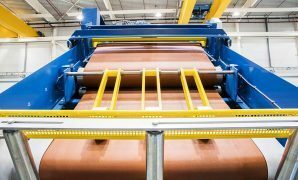 In a continuous flow, slabs are cut into single strips of up to 24 mm slab thickness. The IF 329 Mixer Feeder system handles slab feeding from two or three pallets simultaneously. This enables easy blending of two or three slabs of rubber at the same time. In most applications the VMI Mixer Feeder system is integrated in a control loop with a weighing conveyor at the mixer inlet, and fulfils an essential role in an automatic or semi-automatic blending, portioning and dosing system for pre mixed slab. The Mixer Feeder system is designed to feed an internal mixer and cuts automatically the first stage batches and feeds these batches into the mixer. 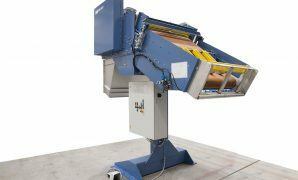 The hugger belt construction on the inlet conveyor of the IF 329 Mixer Feeder system pulls rubber slabs of one or more pallets and smooths out the folds in the rubber slabs before cutting. 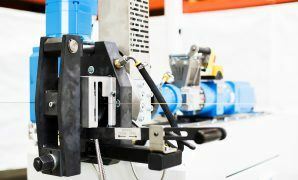 The hugger belt conveyor is driven by a geared, frequency controlled motor, which can be run at a preset high speed for quick loading and at a preset low speed for fine-dosing. 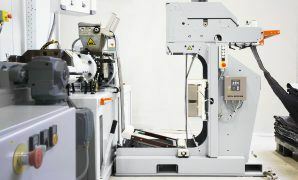 The cutter assembly of this machine has one fixed knife and a rotary knife holder which are driven by a separate geared electric motor. The rotary knife holder carries two knives which cut the oncoming rubber slab.